I'm such a hypocrite. In a past blog I made pretty snarky remarks about expats and how they dress in public. You should see how I have looked when my Mexican friends have dropped by. May 14, 1998, Seinfeld's last show. It may be the last time someone dropped by in America. And Mexicans drop by. This cultural difference has taken a long time to sink in. When was the last time you dropped in on someone? If you're over 50, you'd barely remember it. If you're under 40, you might never have dropped by anyone's place or been dropped by on anyone in your whole life. It's practically disappeared from our culture, probably forever. This story by VOX goes into meaningful detail about how housing choices in the United States, and the discouragement of spontaneous encounters negatively affects us as humans, as a tribe. We know friendships are important but almost universally, we often struggle with making them. The older we get, the more we struggle. As I've mentioned in many of my whiny blogs about friendships in the U.S., we treat friendships like work, fitting our friends in between errands, and grousing over what we are going to do together rather than realizing that the time together, not the event, is what is important. By the time we reach 40, we haven't just hung-out with our friends in years. In Mexico, I've had two people drop by on the same day. Once six people knocked on my door at 10:00 at night. Don't get me wrong. I love it. I want to ply them with wine and inhale every single incomprehensible Spanish word they are saying. This custom of dropping by as practiced in Mexico reminds me of what life is all about: putting down the work or a project for a person you like, maybe even love (You definitely don't need to understand every word, maybe not even most of the words to love someone - as any spouse knows). I've finally, after all these years, learned the lesson and earned the right to stop what I'm doing and say, "This is what matters." In the United States, we now have more people living single than not. Part of learning how to be happy living alone is creating rich solitude. That's not a problem until you get to the point that you stop initiating social engagement. Then before you know it, you've created a little too much rich solitude and you lose a bit your conversational edge when you find yourself back out in the world. You really can get rusty. In light of the new statistic on how many people today are single, maybe Americans should think about reinstating the custom of just-dropping-by. With a nod to Bill Maher's funny show segment "New Rule," our new rule no matter what country we are in should be if they want to see you, you want to see them, even bleary-eyed, hung-over or smelling like bacon. Those days of my time being too important or smelling too badly to spend a few minutes with a friend are over. That being said, I feel totally inadequate opening the door, serving the wine, and getting out the chips, hot sauce and lime when I'm wearing an ex boyfriend's knee-length gym shorts that I accidentally packed when I left him and my hair is tied with a bread bag tie. My Mexican caller, whether male or female, never fails to look less than stunning. I usually spend the first few minutes staring. The hand bag goes perfectly with the jewelry. The stacked heels look adorable with the romper. The starched dress shirt is worn as if it weren't 95 degrees outside. Meanwhile, in the spirit of all things single and American female, I am wearing a tank top I haven't laundered since my arrival, denim shorts with a zipper that always seems to open itself and thick dirty socks that I wear instead of house shoes to protect my feet against the Mexican tile floors. Only one time was I lucky enough to be caught wearing work-out clothes that at matched and some mascara on. Enough is enough. When I leave for Guadalajara in six weeks, I'm taking every item of clothing that no longer looks good on me, getting it laundered and leaving it sitting on my bed for the maid to take away after I've left. I'll be doing some shopping there. I'll still be sweaty and smell bad but the new clothes will be a start. Even when I think back to my very first tour (how I refer to each long-term stay) people were dropping in, people I barely knew. My advice is that if you're planning on staying in Mexico for any length of time, do not pack a single item of clothing you wouldn't want to be seen in, or I promise one way or another, you will be. Why are these Mexican visitors so important to me? As I stand there sweating and apologizing (and uncorking the wine), they are quick to remind me that I am in my own home... and to them I'm beautiful. Next up: A talk with a local about Puebla, Mexico, its Spanish influences, its cuisine and its legends. Most recent: Five scenarios in ten days of how even a little Spanish makes a difference. I'm Kerry Baker and author of two books, the "Interactive Guide to Learning Spanish Free Online," a curation of the best free tools online, with links and study plans. Don't be one of those expats who doesn't speak any Spanish! The Guide takes you via interactive links, to the best free tool and site features on the web, most you'd never find in a Google search (like the ones based in Spanish). Study from your laptop e-reader or tablet, like the Amazon Fire. I love my Acer Aspire for studying. It's a slim, lightweight laptop that perfect for traveling frequently between countries. Well worth the investment. 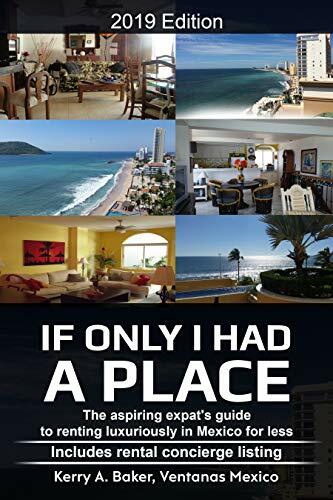 Her second book "If Only I Had a Place," is a guide to renting in Mexico for potential expats, giving yo a system to rent luxuriously year after years. The new book includes a listing of rental concierges in all the most popular expat cities. Check out the reviews!